Hyacinths are common Easter flowers and are famous for their sweet scent. 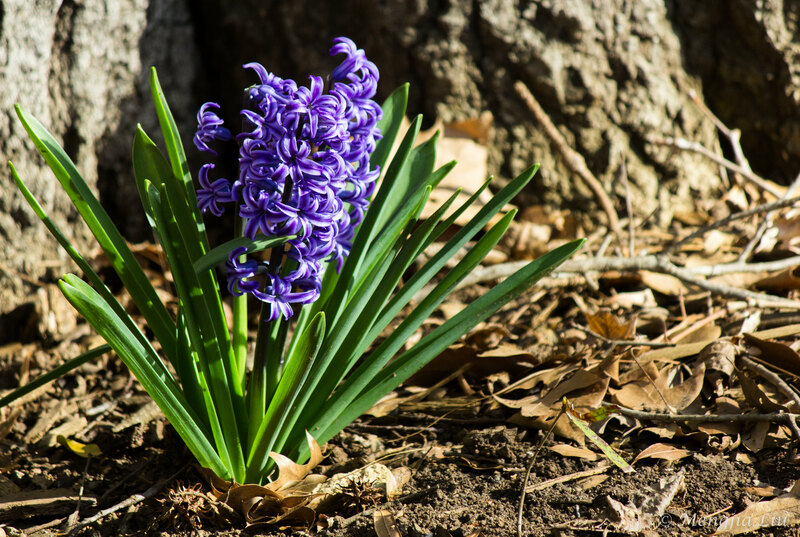 According to popular legends, the purple hyacinth symbolizes sorrow and seeking forgiveness. This meaning may have been derived from the Greek legend about Apollo and Hyakinthos. When Hyakinthos was accidentally killed, a Hyacinth grew from his blood, and Apollo’s tears turned the Hyacinth purple. I found this particular Purple Hyacinth blooming alone at the base of a large tree. I was quite intrigued by the way this vibrant flower was surrounded by dead leaves and barren soil, which not only provided a nice contrast to the photo, but also seemed to carry out the symbolism. Since these flowers only bloom around March and April, Easter is usually a great time to appreciate these lovely forgiveness flowers.